With half of 2011 already gone and virtually every region of the country stricken to some degree by natural disasters, this year is shaping up to be one of the most unique—and costly—in many years. Natural disasters play a key role in insurance premium rates - specifically property & casualty. Because of our central location, Wisconsin has been somewhat protected from price increases due to "coastal" losses, but not anymore. America's mid section, long popular with insurers because of the lack of big coastal risk exposures, is proving conventional wisdom wrong and ringing up as much as $7 billion in losses from the May string of record-breaking tornadoes alone. Missouri's state insurance department said on June 30 that insurance companies report receiving 14,910 claims on homeowners, commercial and vehicle insurance policies so far. They have paid out $509 million on those claims. The state agency says insurance companies expect total claims from the tornado to reach nearly 17,000. The department also says some of the claims already received were probably partial, with more money likely to be paid on them. Insurance director John Huff says the Joplin tornado will be the largest insurance payout in Missouri history, reaching $1.5 billion to $2 billion. In addition to the tornadoes in Missouri, disasters ranging from flooding along the Missouri River to wildfires in Texas and Arizona have damaged, destroyed or otherwise impacted scores of businesses, jobs and crops this year. And, we have the rest of the 2011 hurricane season ahead of us. It's not only the U.S. natural disasters that will affect our premium rates moving forward. 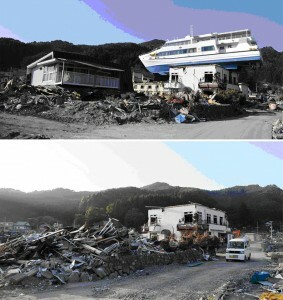 Of course there's the world's costliest natural disaster, $300 billion (and counting) in Japan (see rebuilding before and after photos at the bottom of this post), and e-coli outbreaks in Europe still being reported, three quakes in New Zealand and the floods in Australia, gave world-wide reinsurers their worst spring ever. The toll was twice what reinsurers counted on losing for the entire year and erased half the world’s excess reinsurance capacity. 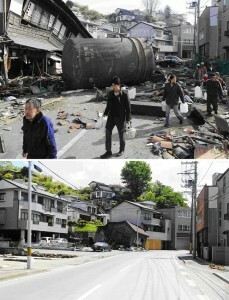 "Given recent catastrophe loss events, it is clear that global underwriting results will deteriorate further in 2011. This indicates that prices are inadequate,” Daniel Staib, a co-author of the World Insurance in 2010 report. Both insurers and reinsurers are braced for larger losses, even as reduced capital makes the remaining money a more precious commodity. With this said, it is likely over the next 12 months that we start to see an increase in premiums, a market that has been soft since 2003. 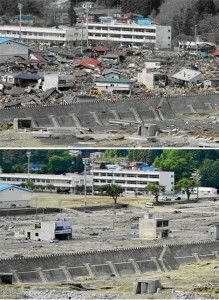 Here are some before and after photos of the progress that Japan is making on rebuilding after their triple catastrophe. 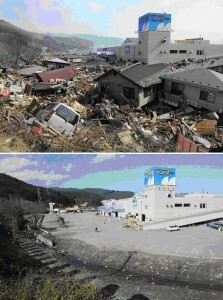 Japan continues to deal with the enormous task of cleaning up and moving forward three months after the 9.0 earthquake and tsunami that devastated the northeast coast. Local authorities are still dealing with the damaged Fukushima Daiichi Nuclear Power Plant, and now the rainy season, which could increase the risk of disease as workers clear away the debris, is approaching. 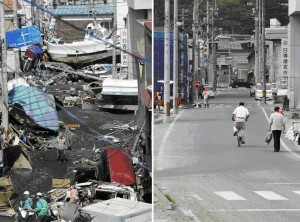 These images mark the three-month point, as well then-and-now images of the destruction shot by Kyodo News via the Associated Press.